So… there's a ceiling on how super they'll be, eh? 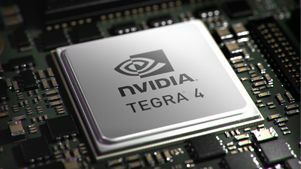 Nvidia and ZTE are working round the clock to get the first Tegra 4 handset out the door and onto China's shop shelves by July 2013. The as-yet unnamed device will feature Nvidia's next-gen chip featuring 72 custom GPU cores and a quad-core Cortex-A15 CPU - that means faster browsing, better graphics and potentially support for 4K Ultra HD graphics. No self-respecting super phone would come without 4G/LTE connectivity and ZTE's effort is no exception. That's about it on handset details; other than the fact that the chip will allow some power efficiency improvements ("great power efficiency!" says ZTE's release - we'll see). After the Tegra 4's grand unveiling at CES 2013 in January, the two companies are hoping that the first handset will launch in China in the first half of the year. Unfortunately there's no hint of how soon after that the Tegra 4 toting ZTE super phone will make it to the rest of the world. Will we get a glimpse of the elusive handset at MWC 2013 next week? Doubtful, but we'll be keeping our eyes peeled.